Lawn sod installation can be a great alternative to seeded grass for starting a new lawn or for lawn repair. Grass sod is professionally grown and then transplanted to your location for an instant lawn. Proper sod installation is important as the right installation practices will help the roots establish themselves. A professional sod installer can make sure this is done correctly. At Green Solutions our experts have 80 years of industry experience to help you get the lawn you have always wanted. 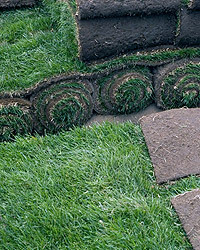 Our sod service uses professionally grown sod that is clean and healthy. After laying the sod with proper care it will take root within a few weeks, and then our Lawn Care Program will insure that your new sod stays healthy. Sodding services are designed to provide our customers with a lush green lawn that they can enjoy throughout the year. We can also help maintain your grass sod for years of enjoyment and added curb appeal. Discover why people trust Green Solutions for a lawn that is always green.